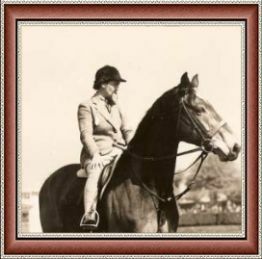 Waterford Hunt Pony Club is extremely fortunate, in that Mrs Robin De Vere Hunt, who was appointed as the first District Commissioner of Waterford Hunt Pony Club, maintained a diary of all the pony club activities for the period she held the position of District Commissioner. She has very kindly allowed us to extract information from the diary. The following extracts summarise the early activities in Waterford Hunt Pony Club. Mrs Hunt was District Commissioner of Waterford Hunt Pony Club for seventeen years and we are all very grateful for the huge contribution she made to the Branch. Mrs Hunt the first DC. In the top one she is displaying a rosette she won and in the next one she is judging at a show in South Africa with her father. 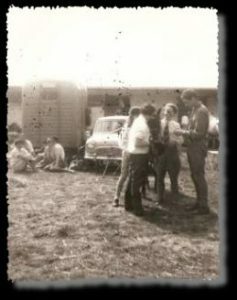 Waterford Hunt Pony Club was inaugurated at a meeting at Whitfield, Butlerstown, Co. Waterford on 13th August 1962. It was unanimously decided by all present to start the Branch. Mrs. Archer Houblon asked Mrs. Robin De Vere Hunt to be District Commissioner and at the request of Mrs. Hunt, Mrs Atkins was appointed to the position of Secretary. 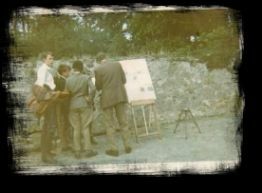 The first working rally was held at Butlerstown on Tuesday 28th August 1962, by kind invitation of Mr. & Mrs. Parkhill at 2.30pm.Twenty two children attended mounted and a lot more were present on foot. Thirty five stated they wished to be members. Rides were taken by Deirdre Whitehouse, Ronnie Dawnay and Anne Poore. Robin De Vere Hunt helped instruct the top ride in cross country. Scilla Cibitt and Corisan Harrison and Noel helped with bending poles and the hankerchief game was played by the middle ride. At 4.30pm the children were given lemonade and buns. Saturday 8th September 1962: The second working rally was held at Woodlands by kind invitation of Mr & Mrs Gallway. Thirty children were present and the membership rose to forty four. Rides were taken by Lady Templemore, General Dawnay, Major Wade, Miss Whitehouse and Mrs Connors. Instruction included a talk on hunting to the top ride, points of the horse and colours of the other rides. There were a lot of children without ponies, but they all got a short ride. Badges were given out and a notice was put on the board about hard hats which were missing from many heads. Wednesday 5th December 1962: The first committee meeting was held at The Glebe, Bonmahon. Those present were, Mrs Atkins, Miss Poore, Lord William Beresford, Robin De Vere Hunt and Mrs De Vere Hunt. Apologies were received from General Dawnay and Lady Waterford. A discussion took place about plans for Christmas holidays. It was agreed to ask Mrs. Gillie Connors to join the committee. Later she agreed to do so. Friday 28th December 1962: Despite snow and frost Colonel Dudgeon and Penny Moreton arrived at Comeragh Lodge on Thursday for the film show at Woodhouse on Friday, which took place at 3.30pm. Friday 4th January 1963: The working rally scheduled at the indoor school at Curraghmore was cancelled due to snow and frost. Wednesday 27th February 1963: Committee meeting at Comeragh Lodge at 5pm, attended by General Dawnay, Mrs Atkins, Miss Poore, Mrs Connors, Robin De Vere Hunt and Mrs Hunt. Plans for Easter were discussed. 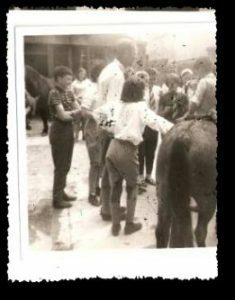 Monday 8th April 1963: Pony Club meet at Comeragh Lodge at 11.30am. Sixty two people were present. Lady Dill, The Templemore family, Major Murray Smith and David and the Cairns family. After the meet, Colonel Cairns gave a very good talk to the assembly on hunting – foggy day but a lot of hunting took place. Wednesday 10th April 1963: Working rally at Stafford Lodge by kind permission of Mr. Larry O’Byrne. Twenty five members were present. Tom Morgan came to help instruct, Anne Poore and Mrs Hunt did the rest. 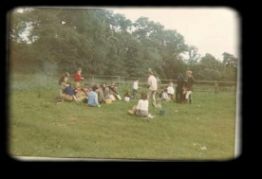 The pictures below were taken at a three day camp in 1966. Tuesday 16th April 1963: Working rally at indoor school, Curraghmore. Instruction by General Dawnay, Mrs Whitehouse and Miss Walker. Friday 19th April 1963: At Yeomanstown inter branch hunter trials, our “A” team were placed 3rd. They consisted of Shirley & Simon Umpreville and Tonkie Odlum. The “B” team completed the course – Meriel Beresford, Mary Moore and John Cranley. Saturday 3rd August 1963: Working rally at Knockeen, Butlerstown, by kind permission of John De Bromhead. Fifteen members attended. Rides were taken by Rosemary Ponsonby, Deirdre Whitehouse and Mrs. Hunt. Rosemary gave the juniors a talk on bits and they played the potato race. Seniors had a lunging demonstration with Blackberry (her hunter) and then lunged their own ponies. Monday 12th August 1963: Working rally at Gardenmorris, Kill, by kind invitation of Major O’Shea. Seventeen members attended.It commenced with a saddlery inspection. Members were paired off and given a list of things to find, chestnut leaves, nuts, Spanish chestnut, sycamore pods, sheep’s wool, fir cones, something poisonous to horses, heather, oak leaves, horse shoe, meadow sweet, rowan(mountain ash), rye grass, bailing twine and a feather. Friday 23rd August 1963: Area competition at Kilfrush. Tonkie Odlum was entered, but had to cancel. Monday 26th August 1963: Working rally on strand at Woodstown. Rides were taken by Pat Wade and Mrs Hunt. 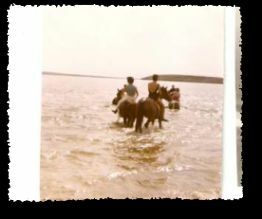 A grooming lecture and demonstration were given by Anne Poore and Mrs Hunt organised a ride in the sea. Mr. Cranley came to give a lecture. Gillie Connors and Mrs Umpreville organised bending races. Mrs. Archer Houblon came to inspect. Thurs 21st November 1963: Committee meeting at Comeragh Lodge. Present were Mrs Atkins, Miss Poore, Miss Walker, Lord William Beresford, General Dawney and Mrs. Connors. Summer 1964: A mock C test was taken by Nicola Beresford, Ken Parkhill, Marie Anne Hanrahan, Caroline Foster, Anne Gaule, Valerie Parkhill and Meriel Beresford. Watering and feeding was examined by Miss Walker and road sense by Major Wade. The following passed the “C” test, Jenny Hunt, Ken Parkhill, Valerie Parkhill, Caroline Foster, Marie Anne Hanrahan, Nicola Beresford and Meriel Beresford. The “B” test was passed by Caroline Odlum. The test was held on 22nd August 1964 and the examiners were Lady Templemore and Mrs Archer Houblon. Mon 9th August – Wednesday 11th August 1965: A three day rally was held at Pallas and was attended by Jenny Hunt, Dermot Power, Max & Vicky Morris, Una Jeffers, Brid Kiely, Kenneth Kiersey, David & Mairead Whittle, Barton Hill, Nicola Beresford, John Cranley, Marie Anne Hanrahan, Rhoda Cunningham, Jacqueline Morgan, Pat Power and Charlotte Hay. Thursday 2nd January: Working rally at Curraghmore indoor school. 26 members present. 12 pm-1pm. Ride instructed by General Dawnay. 12-12.30pm -B ride- lectured on tack cleaning by Anne Poore. 12.30-1pm B ride instructed on hunting terms by self. 1-1.30pm Break for sandwiches, buns and hot drinks. A room was provided with heaters, tables and chairs by Lady Waterford. (This date was a holiday, in future this should be avoided as during cow time, children may be required at home) Monday 6th January: Party at Woodhouse for film show, given by Mrs. Di Bowly. She showed hunting seens of Duhallow, some of Badminton, and Stockholm, about 60 people were present. Friday 13th March: Committee meeting at the Gleebe, Bonmahon. Present Mrs. Atkins, Mrs. Connors, Ms.Walker, Ms. Poore. Wednesday 25th March: Working rally at Stafford Lodge. Owing to wet conditions, it was a dismounted rally, only 7 children turned up. Rosemary Ponsonby came to help. Anne Poore talked and demonstrated on pulling and plaiting manes. I did some bandaging with them and also gave a very short talk on shoeing. We then drove to see the hounds fed. Tuesday 31st March: Working rally on the strand in Woodstown instead of Butlerstown as planned because of the wet state of the ground. Rosemary Ponsonby attended with her bits and games. Other helpers were Colonel R. Dawnay and Scilla. Major Wade gave a lecture on minor ailments to some and Scilla took a ride into the country. Friday 3rd April: Meet at Comeragh Lodge. The General gave a talk to members before moving off and a good days hunting took place around the forestry at Gortnalogh and Tay Lodge and later the Lemybrien forestry. Visitors included members from Wexford and Kilkenny, the Templemores, Cairns and Murray-Smiths. Monday 6th July: Committee meeting at Comeragh Lodge – Present Mrs Atkins, Mrs Connors, Lord W Beresford, Miss Poore, Miss Walker. The chief matter discussed was whether we should hold a 3 day rally at Pallas, Woodstown. It was decided to find out if parents would support the idea and forms were sent to find if we could get a minimum of 14 children to attend. Later only 12 names came forward, so the idea of the 3 day camp was abandoned. Tues 11th August: Working rally at Curraghmore. 16 members attended. Captain Morgan took the larger ones in the school before going out to the Olympic jumps and the river. Miss Poore took the smaller ones for a talk on saddling, bridling, rugging and leading. Then I took them in a ride in the school. Major Foster gave a talk on shoeing in the forge. Helpers included Miss Walton, Miss Walker, Mrs. Kenny. Monday 17th August: Working rally at Butlerstown to prepare for the C test. Lectures were given on watering & feeding by Miss Walker and Road Safety by Major Wade. A mock test was done with those preparing for C test. Mrs Gillie Connors & Miss Geraldine Walton examined. Saturday 22nd August : Test day at Pallas, Woodstown: Examiners were Lady Templemore and Mrs Archer Houblon, M.V.O. Passed B test, Caroline Odlum, Passed C Test, Jenny Hunt, Ken Parkhill, Valerie Parkhill, Caroline Foster, Marie Anne Hanrahan, Nicola Beresford, Meriel Beresford. Saturday 29th August: Gymkhana at Woodhouse. Musical Poles 1st Ollie Carroll, 2nd Mary Anne ,3rd B Hally. Jumping 1st Meriel, 2nd Tonkie, 3rd Valerie. Jumping U 12 1st Valerie, 2nd Valerie, 3rd Jeremy Cairns. Friday 20th November 1964: Committee meeting at Whitfield – Present, General Dawnay, Lord William Beresford, Mrs Connors, Miss Poore, Major Wade. Christmas Holidays were discussed. Wednesday 30th December: Party held at Riverdale, Newtown, Waterford. (Mrs. Odlums). 26 members were present. Thursday 11th March 1965: Committee meeting at Tempbyvick House, Bonmahon, by kind invitation of Mrs Atkins. Present were Lord W Beresford, Miss Poore, Miss Walker, Mrs Connors & Major Wade. Planned for Easter holidays, meet at Comeragh Lodge, Working rallies at Curraghmore & Parkswood Lower, to include paper chase & mounted games, as Lord Waterford thinks the poor attendance may be caused by too much work and not enough play. The meet took place, also the paper chase and rally at Curraghmore. Tuesday 25th May: Committee meeting at Comeragh Lodge to discuss 3 day rally to be held at Pallas 9th-11th August. Monday 9th August 1965: 3 day Rally at Pallas. 10.30am Blacksmith removed hind shoes. 10.45 opening address by DC.11.45, Rides under Mrs Hunt & Miss Poore. 12.30, Water & Feed. 1pm Lunch break, 2pm, Lectures & demonstrations. 1.trimming, 2. Wisping & how to make one, 2.45pm Rides & visiting Instructor Mrs. Ponsonby, 3.30 Mounted games, 4pm tack cleaning. Tuesday 10th August: 10.30am. 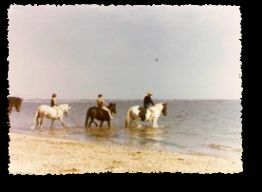 Catch Ponies, 10.50, Grooming & rugging up, 11.50, Slides & talk, 1pm, Lunch break, 2pm, Rides to the sea. Wednesday 11th August: 10.30am Catch Ponies, 11am Lunging demonstration, 11.30am, Rides, 12.45, Watering & feeding 1pm, Lunch break, 2.30, Rides, visiting Instructor Capt. Haccius, 3.30, Film on hunting, 3.45, Clean tack. Attended 3 day rally, Jenny Hunt, Dermot Power, Max & Vicky Morris, Una Jeffers, Brid Kiely, Kenneth Kiersey, David & Mairead Whittle, Barton Hill & friend, Nicola Beresford, John Cranley, Mary Anne Hanrahan, Rhoda Cunningham, Jacqueline Morgan, Pat Power, Charlotte Hay, E Gallway. Saturday 28th August: Gymkhana at Woodhouse. Friday 31st December 1965: Christmas Party at Whitfield. Started with a true & false, won by Ken Parkhill, second, Marieanne Hanrahan, third, M & N Beresford, fourth, Kevin Kiersey. Slides shown by Mr. Martin. Friday 4th March 1966: Committee meeting Comeragh Lodge. Discussed Easter programme. Saturday 2nd April: Met at Kildarmody. 31 members attended. A lot of new members from Joan O’Mahonys riding school. Tuesday 24th May: Committee Meeting at Templeyvick House, Bonmahon. I welcomed Miss Joan O’Mahony, new committee member. Summer programme discussed. Saturday 25th June; Beginners rally at J O’Mahonys yard, Killoteran. 26 members attended. Rides taken for 20 minutes, then we changed other riders on to the ponies who were mostly hired from J O’M. When they weren’t riding they were given a talk on grooming. Saturday 2nd July: Beginners rally. Mrs Connors examined for D test. The following passed, John Gossip, Pat Power, Francis Shanahan, Ella Shanahan, Carlo Uistianni and Mandy Kelly. Monday 22nd – Wednesday 24th August: 3 Day rally at Pallas. Blessed by marvellous weather. Mrs Cresswell helped and stayed at Ballydavid House. Miss Walker examined for D test, the following passed, Geraldine Shipsey, Ronald Rutberger, Charlotte Haye, Barton Hill and Helen Quane. Thurs 5th January 1967: Party at Newrath House by invitation of Mr & Mrs Morris. Dr Quane showed his film of the 3 day rally after tea. Wednesday 29th March: Beginners rally at Curraghmore, helped by Anne Poore. Saturday 1st April: Hunter Trials at Sallaheen. The day could not have been wetter. Results: 1st K & V Parkhill, 2nd K & K Kiersey, 3rd P & R Cunningham. Saturday 8th April: Inter Branch Hunter Trials at Cloneen, Fethard, Co. Tipperary. 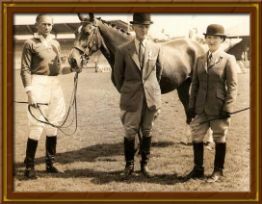 The following were sent as a team, Ken Kiersey on Smokey, Kenneth Parkhill on Mischief & Valerie Parkhill on Seven Up. They were fourth in the consolation pairs. Thurs 22nd June: Committee meeting at Comeragh Lodge. Saturday 8th April: Beginners rally at Joan O’Mahonys, Kilotteran. Not enough ponies to go around so they changed at half time. Tues 18th April: Beginners rally at Whitfield, again not enough ponies. Anne Poore took the dismounted ones grooming, bridling & saddling. Mon 21st – Wed 23rd August: 3 day rally at Pallas, Woodstown. Thurs 31st August: Quiz party at Dunmore East with the Tipperary Branch. In spite of bad weather members bathed before going to the fishermans hall. The Power family, Ocean Hotel provided lunch. Our team was, David Whittle, Dermot Kiersey, Pat Power, Vicky Morris, Charlotte Hay & Pigeon Cunningham. Waterford won. 15th Sept: The following passed the C test, Helen Quane, Dermot O’Tuathlain, Vicky Morris, David Whittle & Rhoda Cunningham. Mrs Ponsonby examined. 27th November 1967: Committee meeting. Mrs Kenny proposed to be elected as Secretary. Christmas party had to be cancelled owing to foot & mouth restrictions. Easter Holidays: rally at Butlerstown. Hunter Trials at Ballinaclough. Tues 2nd July 1968: Beginners rally at Butlerstown. The following passed D test, Carmel Heveran, Fiona Healy, Bill Shipsey, Cliona Kiersey, Margaret Boland, Fiona Dowley, Pat Hanrahan, Gerard Connors, Laura Shanahan & John Bowen. Tues 9th July: Beginners rally at ballyhussa. Scavenger hunt won by Pat Hanrahan & Gerard Connors. Mon 19th – Wed 21st August ’68: 3 day rally at Pallas. 30 attended. Passed B test, Jenny Hunt, Passed C test, Kevin Kiersey, Jean O’Toole. Mon 2nd Sept: Quiz party at Dunmore. Teams of 5 from Wexford & Tipperary. 1st Tipperary, 2nd Wexford, 3rd, Waterford. Friday 3rd January 1969: Christmas party at Newrath House attended by, Jenny Hunt, Vicky, Max, Alicia & Michael Morris, Val Parkhill, Tyrone & Charles Beresford, Helen & Anne Quane, Martin Quilty, Pat & Niall Power, Maurice Walsh, Susan Krans, Geraldine Shipsey, Julie Power, Lynda Keogh, Michael Farrell, Tony Maher, Margaret Boland, Marianne & Pat Hanrahan, Noelle Breen, Eddie Shanahan, Asta Helleris, Gerard Connors, Hilary Grace, Carlo Uistianni, Fiona Healy, Donal O’Tualoin, Liam Farrell, Ageas Lane O’Kelly, John Quilty, David & John Bowen. Monday 6th January: 9 or 10 members attended the Junior Hunt Ball at the Ocean Hotel, Dunmore. Saturday 5th July: Working rally at Ballyhussa. 17 members attended, but only 9 ponies. Mrs Ponsonby took the ride & Major Wade & Mrs Goff gave a grooming demo. Monday 25th – Wed 27th August: Working rally at Pallas. Thirty four members attended. Instructors, Miss J Evans, Mr Mike Simonds & Mrs Mallender. Colonel Dawnay took the ride to the sea. Ponies were turned out in Ballydavid & Kilcop. Prizes, 1st Geraldine Shipsey, 2nd Mary Anne Hanrahan, 3rd Helen Quane, 4th Pat Power, 5th Laura Shanahan, 6th Kevin Kiersey & Fiona Healy. Sun 31st August: Inter Branch Quiz held by Duhallow at Mallow. We sent team of Helen Quane, Kevin Kiersey, Laura Shanahan & Pat Power & they were 2nd. Monday 1st September: Gymkhana at Piggery, Whitfield. Results. Seniors, 1st Liam Farrell, 2nd Pat Power, 3rd Kevin Kiersey. Juniors, 1st Killian Farrell, 2nd Ann Quane, 3rd David Bowen. Monday 22nd December: Finals of inter Branch Quiz. Although we didn’t qualify to take part, the following attended at the Minella Hotel, Linda Keogh, Geraldine Lynch, Kevin & Cliona Kiersey, Laura & Rosemary Shanahan. Thurs 8th January 1970: Christmas party at Miss Walkers, Springfield, Portlaw. Saturday 1st April: Hunter Trials at Ballinaclough, Sporthouse, by invitation Eddie Crotty. 37 members attended. Pairs, 1st Tony Maher & Pat Power, 2nd Carmel Haveran & Fiona Dowley, 3rd Tom Roe & Hilary Grace. Individuals: 1st Pat Power, 2nd John Leech, 3rd Tony Maher, 4th Gerard Connors. Saturday 9th May: Mrs Wynmaher took a ride of seniors at 11am and juniors at 2pm. Cliona Kiersey presented a Waterford Glass piece and Mr Shipsey gave a thank you speech. Saturday 27th June: Working rally at Feddans, Rathgormack at 2.30pm. Saturday 11th July: Junior working rally at Butlerstown. 28 members attended. Saturday 25th July: Senior working rally at Seafield to choose a team for area competition, team Liam Farrell, Pat Power, Geraldine Shipsey & Jim Murphy. Monday 24th – Wednesday 26th August: 3 day rally at Pallas. Results tack competition, 1st Helen Quane, 2nd Anne Quane, 3rd Fiona Healy & Carmel Heveran, 4th Laura Shanahan. Jumping competition 1st Pat Power & Kevin Kiersey, 3rd Liam Farrell. 31st August 1970: Test day at Killoteran. Results C test. Fiona Dowley, Carmel Heveran, Francis Shanahan, Laura Shanahan, Colm O’Tuathalain, Gerard Connors, Fiona Healy, Hilary Grace, Cliona Kiersey, Dermot Murphy, Margaret Boland & Jim Murphy. Thurs 7th January: Christmas party at Springfield Portlaw by invitation Miss Walker. Presentation to Mrs Atkins on her retirement from the Secretaryship. Mrs Mallinder taking on. 58 members attended. Wednesday 7th April: Meet at Butlerstown. Saturday 26th April: Junior working rally at Ballyhussa. 20 members attended. Monday 5th – Wednesday 7th July: 3 day rally at Pallas. 53 members attended. Tack & grooming competition: 1st Helen Quane & John Halley, Junior 1st Avril Murphy. Rosemary Shanahan passed her D test. Saturday 17th July: Working rally for those who could not attend 3 day rally. 19 members attended. Thursday 19th August: Gymkhana at Whitfield, results, Seniors 1st Killian Farrell, 2nd Gerard Connors, 3rd Cliona Kiersey, 4th Stan Power, Juniors, 1st Frank Walsh & Niall Power, 3rd Denis Hayes, 4th Francis Murphy. 28th August: Dismounted rally at Comeragh Lodge. Thursday 30th December: Meet at the Sweep. 39 members attended. Liam Farrell was made assistant field master and Killian Farrell & Denis Hayes were gate shutters. Monday 3rd January 1972: Christmas party at the Ocean Hotel, Dunmore east. 68 attended. Miss P Stokes & Brendan Corscadden gave a talk & film on a 3 day event in Germany. Mr Power showed slides at recent rallies. Sunday 27th February: Quiz competition. Our team of Geraldine Shipsey, Carmel Heveran, Gerard Connors & Lily Brophy competed against Tipperary & Avondue winning by 1 mark. Tuesday 4th April: Hunter Trials at Ballinaclough. Results: 1st Pat Hanrahan, 2nd Liam Farrell, 3rd Frank Walsh,4th Hilary Grace. Thurs 6th April: Finals of the Inter Branch Quiz held by Kildare at Newbridge attended & won by our team. They beat Limerick, Louth & Kildare. Team: Carmel Heveran, Fiona Dowley, Gerard Connors & Bill Shipsey. Friday 7th April: Two teams competed at the Inter Branch hunter trials, Teams Liam & Killian Farrell & Conor Coughlan, Gerard Connors, Bill Shipsey & Pat Hanrahan. Saturday 8th April: Working rally at Whitfield piggery. D Test passed by Geraldine Farrell, Sue Chapman & Katrina Glanville. Tuesday 6th June: Committee meeting at Grove House, Curraghmore. Anne Poore appointed new Secretary. Saturday 24th June: Working rally at Mount Congreve. Monday 10th – Wednesday 12th July: 3 day working rally at Pallas. 50 members attended. Rides taken by Mr Bill Lugh, Major Hugh Dawnay, Mrs J Wilkinson, Pat Power & Helen O’Mahony. Monday 24th July: Working rally for those who did not attend the 3 day rally. Venue Adamstown, Kilmeaden. Tuesday 22nd August 1972: Gymkhana at Whitfield piggery. Prizes: Seniors 1st Stan Power, 2nd Fiona Dowley, 3rd Cliona Kiersey & Niall Power. Junior: 1st Geraldine Farrell, 2nd Dermot Walsh, 3rd Avril Murphy. Saturday 2nd Sept: Dismounted rally at Comeragh Lodge. Friday 29th December: Area Quiz at Royal Hotel, Fermoy. Our team of Carmel Heveran, Gerard Connors, Laura Shanahan & Stan power, beat South Union, Tipperary, West Waterford, Muskerry, Duhallow & United. Sunday 7th January 1973: Quiz night at Ocean hotel, Dunmore East. Teams, Carlow, Limerick & Waterford. 14th April: Hunter Trials at Ballinaclough. Results, Juniors: 1st Francis Connors & Nicholas Connors, 2nd Geraldine Farrell & Ita Coughlan, 3rd Caroline Connors & Sharon Connors. Senior Pairs: 1st Carmel Heveran & Fiona Dowley, Joint 2nd Pat Hanrahan & Gerard Connors, Killian Farrell & Denis Hayes, 3rd Eugene Power & Gus Walsh. Saturday 28th April: Working rally at Park House, Stradbally for members under 12 & those who had not taken part in hunter trials. Gerard Connors laid a paper chase through the woods, Francis Connors was first back. 9th July – 11th July: 3 day rally at Joan O’Mahonys riding school. A field was lent by the Foleys. The riding competition was won by Gerard Connors. Saturday 1st September: Mountain ride starting at Mahon falls. 34 members attended. Saturday 29th December: Meet at the Sweep. Friday 28th December: Marianne Hanrahan now BHSAI took a ride of 11 in Joan O’Mahonys school. January 2nd 1974: Christmas party in the Fishermans Hall, Dunmore East. 54 members attended. Tuesday 11th April: Quiz competition at Kitlers Inn, Kilkenny, 1st Wexford, 2nd Limerick, 3rd Waterford, 4th Kilkenny, 5th West Waterford. Team, Gerard Connors, Carmel Heveran, Stan Power, Rosemary Shanahan. Thurs 18th April: Hunter Trials at Ballinaclough. Junior Pairs: 1st Kieran Halley & Audrey Malcolm, 2nd Audrey Malcolm & Margaret M Power, 3rd Clare Foley & Valerie Prendiville. Senior Pairs: 1st Fiona Dowley & Carmel Heveran, 2nd Gerard Connors & Pat Hanrahan, 3rd Killian Farrell & Denis Hayes, 4th Francis Connors & Nicholas Connors. Monday 8th July: Working rally at Joan O’Mahonys riding school for members unable to attend 3 day rally. Wednesday 17th – Friday 19th July 1974: 3 day rally. Six rides were taken by 3 visiting Instructors and Pat Power, Maryanne Hanrahan and Jenny. Lectures were given by Miss Getting on riding X country, Major Ponsonby on breaking young horses in a method, and Mr Colton “Lunging”. C test passed by Mary Nolan, Mary Murphy & Sheila Foley. Friday 16th August: the following passed the C test, Patricia Dooly, Philomena Whittle, Bride Crowley & Sheila Foley. Monday 19th August: Gymkhana at the Old Garden, Whitfield. Saturday 5th October: Mrs Morooney examined C test & passed Valerie Prendiville, Tony Gurney, Anne O’Connor, Margaret Mary & Jacqui Deevy. A mounted sponsored ride was held at Portlaw with the proceeds going to the Riding for the Disabled. 31st October: Committee meeting at Major Wades. Membership is now at 117. Saturday 28th December: meet at Woodhouse gate. Monday 30th December: Christmas party at Duggans Lounge, Kilmeaden. Mr John Wright from Bord na gCapall showed some good old films of Badminton, Dressage & learning to ride. Thurs 2nd January 1975: Meet at the Sweep. Quiz competition at New Ross. Team, Tony Gurney, Stan Power, Bride Crowley & Sheila Foley. They were placed 2nd. Wednesday April 2nd: Inter Branch hunter trials at Annsfort, Clonmel. We sent 2 teams, Avril Murphy, Patricia Dooly & Phil Whittle. Francis Connors, Nicholas Connors & Donal Quinlan. Thurs April 3rd: Film & riding demonstration by Miss Micheline Croome Carroll & Bord na gCapall. Friday 4th April: Hunter Trials at Ballyscanlon, Fenor. Results, Junior pairs, 1st Lucy Connors & Phoebe de Blanc,2nd Caroline Connors & Rosemary Connors, 3rd Suzanne Phelan & Patrick Connors. Seniors 1st Francis Connors & Nicholas Connors, 2nd Patricia Dooley & Phil Whittle, 3rd Frank Walsh & Donal Quinlan.